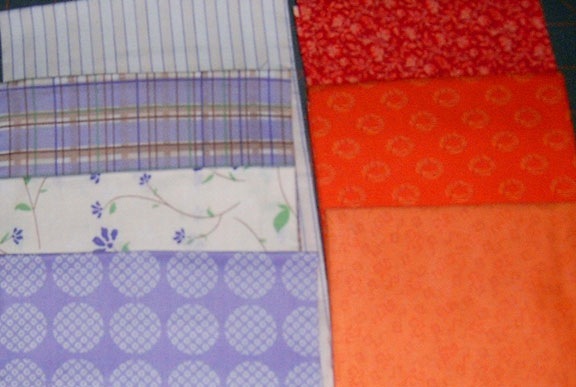 After the frustration education of using the whole sheet, I decided I wasn’t going to sew anymore until I took off the tissue .. first i was dog tired – we had a Saturday with more drama in it than a daily soap opera – that totally whacked me out! Second, I started to think that due to my ‘squeezing’ of motifs, putting something in the small framing border would be a good idea – but I needed the tissue off to see it better and of course I had to see just how this thread looked too .. 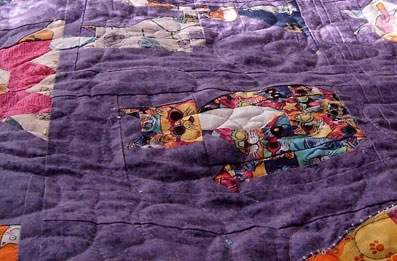 The purple background had enough variations in that the thread seemed to be made for it .. doesn’t stand out for the most part, but looks GREAT on the kitties .. Here’s a closer view of it and you see how the thread suits this quilt .. LOLOLOL .. I just saw a tissue piece that I missed while tearing the tissue last nite **znerk!!! Okay it’s gone now – It’s right under the red bow tie on the left. 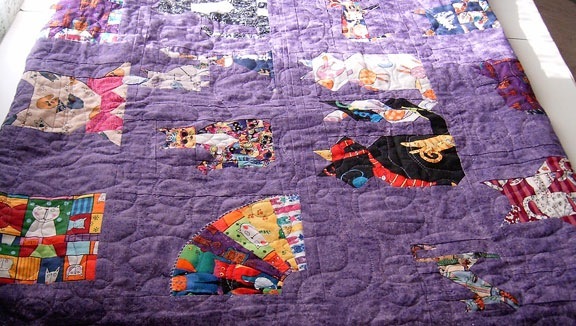 The kitty motif that I picked for this is just the right one to use .. creates enough personality in the blank spots of the quilt that is keeping with the theme, but doesn’t overpower the quilt – nice accent! I’m going to do butterflies in the narrow border and a meeces and kitty paws in the outer border – good thing I’d not printed them up or done my tissue for the outer border as my mind has changed from just the other (after I had already changed it!!). I’m praying that I’ll get a chance to sew in a bit .. it’s a day with one thing or another .. and I’ve just not gotten to it yet .. this really won’t take long and i could have had it done – maybe even the outer border by now ..
Now the orange I’m going to use for the square deal mystery on quiltbug.com – If I have enough orange I would like to make it the main colour instead of the corner colours .. I’m thinking of blue and green or maybe purple and blue or purple and green with this .. not sure .. and the lilac fqs .. not to sure .. I’m sure I’ll think of something – hehehehehe This is going to be my next project 😀 I’m due for a new one and I’ve been looking forward to doing this one – might even do 2 – we’ll have to see. So the borders tonite .. quilt one and then get one set up for doing if not doing ..
Just am loving that kitty quilt girlie girl!! can’t wait to see the butterflies! WOW you are getting very ambitious! 2 new quilts? EEKKK!!! Looking at ur works makes me wish that someday I’ll be able to reach to ur kind of level. It is very intricate and wonderful. Cheers.